Once you finish that apple or banana, what do you do with the core or the peel? Most often, it either goes in the trash or down the garbage disposal. 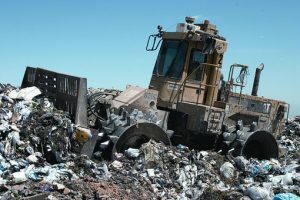 The problem with putting food scraps in to the trash is they head to the landfill and decompose anaerobically (without oxygen) turning in to methane gas. What’s the problem with methane? It’s one potent greenhouse gas that contributes to global warming! Rather than tossing organic food waste out, put it to work by allowing it to decompose and become compost. If you do any bit of gardening, compost, otherwise known as “liquid gold” is great for the soil and for the environment. If gardening isn’t your thing, read through to discover your options. According to the EPA, yard trimmings and food account for 20-30% of US municipal solid waste; 36 million tons of food waste find it’s way to our landfills each year. Say what!?! A family of four spends $1500 on wasted food each year. Do you believe those numbers? I sure do! How many of us have gone on a health kick and purchased all sorts of produce only to find it rotting in the corners of our fridges? If you’re a parent, how many times have you cooked a good, nutritious meal only to put it in front of your child and hear, “ewwww”? Have you pulled the “children are starving in other countries” card yet? I have and still do. conserves resources – both in production of fertilizers and use of water in gardening. Compost acts like a sponge holding water and slowly releasing to the plants. 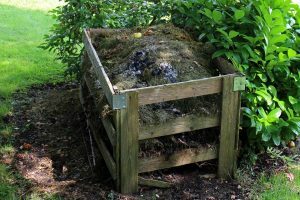 Composting has a variety of benefits and is super easy to do. You don’t need to be a gardener or buy a lot of things to get started. Heck, you can even make your own compost bin. Pinterest has all sorts of DIY compost bins that you can make as simple or as fancy as your heart desires. Ultimately, all you need is space for a pile/bin, organic waste and water. I received a *Deluxe Pyramid Composter as a gift just over 10 years ago. How many people do you know that can say that? Some would consider it an odd gift but I actually asked for one. At the time, a friend had been looking in to compost bins but wanted one with a handle that could be turned. The “turning type” bins were expensive so I went with a standard bin. In hindsight, I should have opted for the “turning type”. I usually forget to turn it and it’s so full that it’s gotten to be a bit cumbersome but I’m determined to make it work for me. Scratching your head wondering why this pile of waste needs to be “turned”? All those little microorganisms need air to continue to produce energy, grow and consume more material. My compost bin has become the receptacle for produce waste, newspaper, toilet paper rolls, leaves, q-tips (without plastic), cardboard, dead flowers, etc. There are some rules around what should and should not go in and while sometimes rules are made to be broken, this is not one of those times. If you put rotting meat in there, not only are you going to attract a lot of unsavory wildlife, your neighbors are not going to be happy come August when it’s 90 degrees and there is an awful stench coming from your yard. There is some science to what and how to compost but this gal takes a more laid-back approach. Science has never been my strength, my brain usually goes in to shut down mode so I stick to the basics. There’s always a chance that something could go wrong. If there is a horrible odor coming from the pile, either you’ve got something in there that wasn’t supposed to go in or, it’s time to aerate. If the pile doesn’t seem to be heating up or nothing is happening, you may need to add some nitrogen. There’s a chance you’re like me and your pile is super big and hard to turn. Try poking some holes in to the pile and pouring in some blood meal or other nitrogen source. My *bin reaches max capacity, generally by February. As the weather warms up and the action starts to happen, even though I’m adding to the pile, it’s getting smaller so I know those little buggers are working hard. My bin has “sliding doors” on the front and back so in theory, I can pull out the “liquid gold” and transfer to my garden. In reality, when I open the “doors”, the material is not fully decomposed. My pile has been going for more than 10 years and I figure I must be doing something wrong, that’s what led me to put together this post. Lack of oxygen is definitely a problem in my bin, so my goal is to aerate more frequently. I found this mac daddy *compost aerator so I’m going to buy one and give it a shot. Another option I may try is to add an *activator or some blood meal. Early on in my journey, I read that activator’s were really a waste of money. My guess is that’s if you are diligent at this composting thing. For the lazy backyard composter such as myself, it might prove to be a good choice. Once I receive the aerating tool, I’ll provide some updates on my Facebook page. What if you’re not a gardener but you are still interested in composting? What can you do with your product? One option is to see if there is a curbside pick up service in your area. I did a quick Google search and didn’t come up with anything in my area but you may be luckier than I. Another option is to seek out a local farmer in your area or a Community Garden. Many times, they will be more than happy to take it off your hands. No luck? Advertise it on Social Media, like Nextdoor or Facebook. Now that you know why you should compost and how easy it can be, what are you waiting for!?! While you’re deciding between a DIY bin or purchasing a bin, pull out that old plastic tub that’s taking up space and start tossing your waste in there. 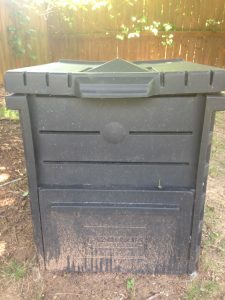 Take a picture of your bin and share it with me on Facebook, I’d love to see your progress. I’ll be sure to share mine as well. I like this post very much – great tips and a good reminder to all of us that we can take steps to improve the environment. I would only add that the container you use for composting should have a good lid on it that cannot be easily opened by wildlife looking for an easy meal. We have a lot of raccoons around here and it is amazing what they can get into. Deborah – great reminder. Luckily we have a fenced in back yard and don’ have to deal with anything more than rabbits. On the other side of our fence is a flood plain so there’s no telling what might show up one day.